There are quite a few external field monitors out there, and a lot of good reasons to have one for just about any camera. 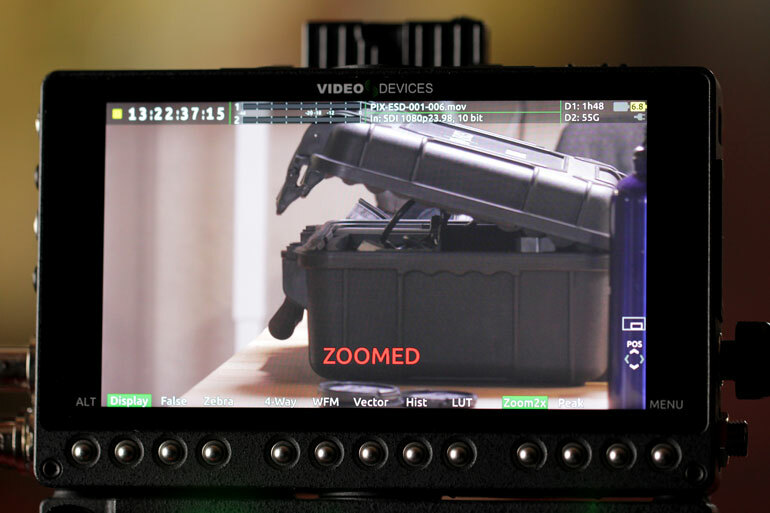 We've written about the SmallHD Focus, which is probably the most popular camera monitor right now. But what about external monitor/recorders? 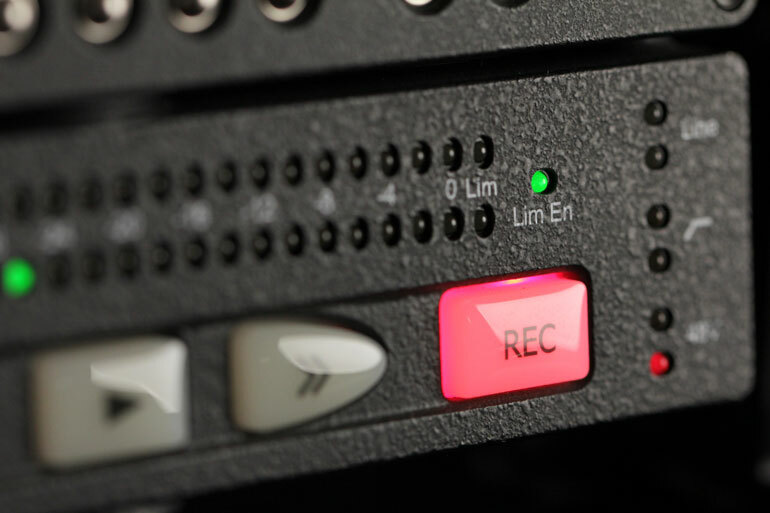 Is it necessary to have a backup recording, in addition to the internal camera recording? Is there a quality improvement with the external recording, as opposed to it being simply a safety proof? ​There's most certainly a cost/benefit analysis with external recorders, but not just with the purchase price. Anytime you add something this bulky to your camera setup, there are going to be negative consequences. But do the benefits outweigh the disadvantages? 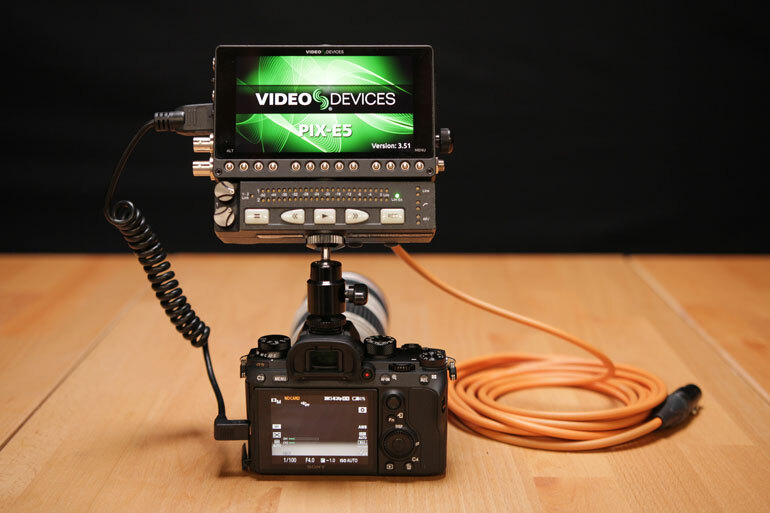 We got to spend a couple weeks with the Video Devices PIX-E5, a 5-inch monitor/recorder that comes in both a cheaper HDMI-on﻿﻿ly version as well as an HDMI/SDI combo version, which is the model we borrowed. We took the PIX-E5 on a fast-paced production trip to several states, where we needed to capture interviews quickly and dependably. Our interview camera was the Canon C300 mkII, but we also hooked up the PIX-E to a Canon C200 as well as a Sony A9. 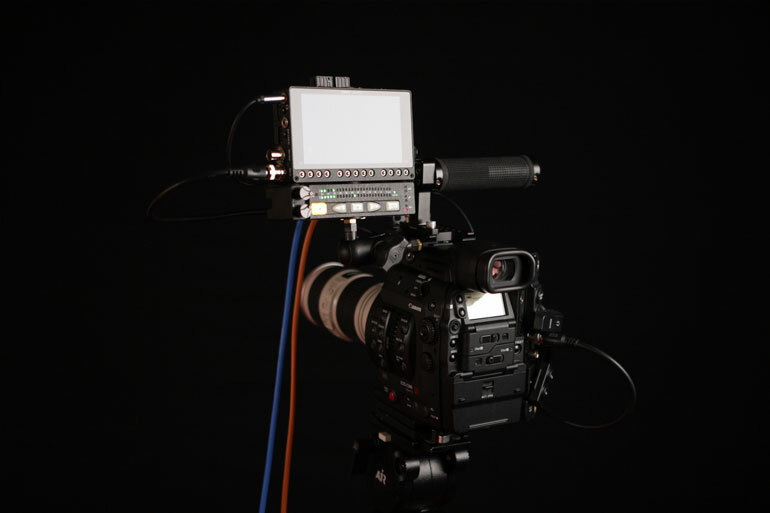 ​Video Devices also provided us with the PIX-LR XLR ﻿Audio Interface, which is a microphone interface and preamp made specifically for the PIX-E monitor/recorders. To our surprise, we found the PIX-LR to be a hidden gem that makes the PIX-E5 an incredibly useful piece of gear for documentary filmmakers and corporate videographers. 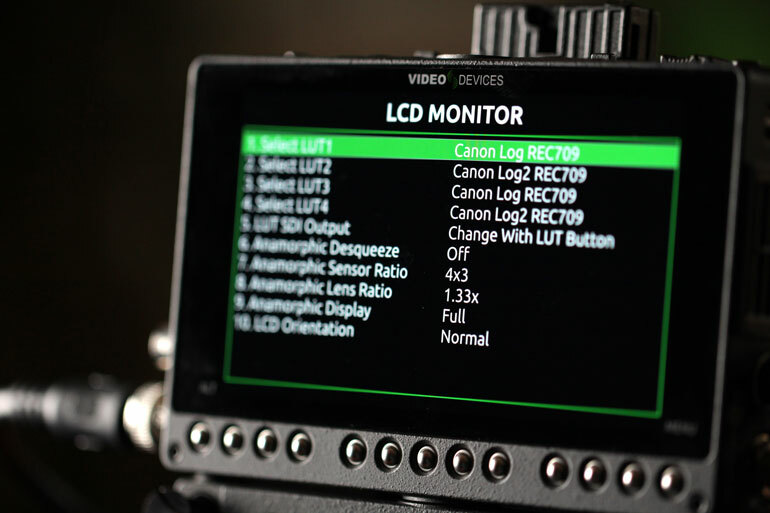 TL;DR: The Video Devices PIX-E monitor/recorders are solid alternatives to Atomos and Convergent Design products. But the PIX-E5 and PIX-E5H rise above the others due to their unique 5-inch size and the availibility of the perfectly fit PIX-LR audio interface. 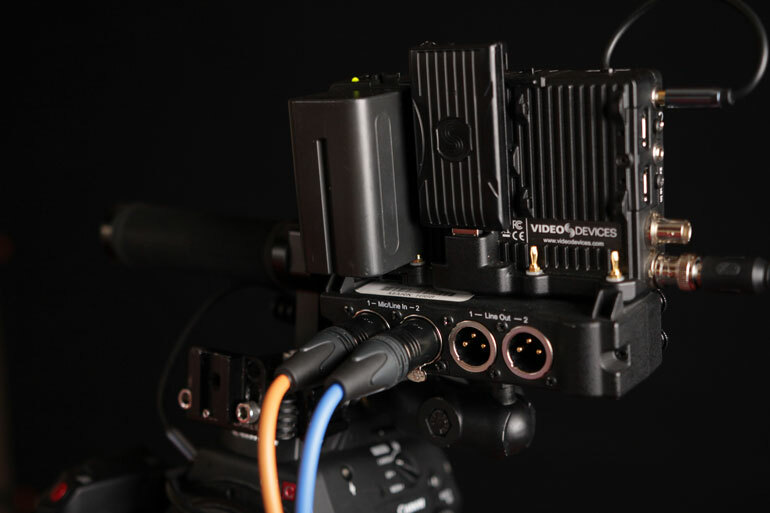 The PIX-LR audio interface, along with the PIX-E5 monitor/recorder, is a unique and essential solution to anyone shooting interviews on small DSLR or mirrorless cameras. It provides both high quality ProRes media, as well as dual-XLR inputs with the top-of-the-line Sound Devices preamps built in. Any documentary filmmaker or corporate video producer would find this monitor/recorder/audio combo an extremely useful piece of gear, even if it only came out during interviews. Is an External HDMI or SDI Recorder Necessary? 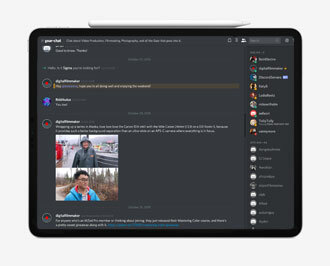 ​In a perfect world you wouldn't need an external monitor, or an external recorder, or even an external audio interface. A professional camera would come with a really great LCD screen with all the necessary on-screen displays such as exposure assist, focus peaking, and color tools. In a perfect world that camera would also come with professional broadcast codecs in the necessary framerates and bitrates, like 10-bit 4:2:2 media with 4K at 60fps, at a decent bitrate like 400mb/s. And that camera would record to multiple cards, both to prevent card failure but also to hand off full resolution or proxy files to the client or editor during a shoot. And of course, there's audio. In a perfect world, the camera would have two XLR inputs, with good preamps and an easy way to monitor and adjust the levels. And maybe it would have good audio limiters. Maybe. Our interview setup, with the PIX-E5 and LR audio interface, and a Nasty Clamp to hold headphones and a clipboard. Of course, that perfect world - and the perfect camera - doesn't exist. If it did, we'd all buy and use that one camera for years, and camera manufacturers would go broke. So instead, we are accustomed to rigging our cameras with monitors, recorders, audio preamps, and more. 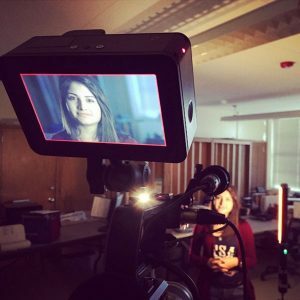 ​There are a few good reasons for getting an external monitor/recorder for a small camera like a Panasonic GH5 or a Sony mirrorless. 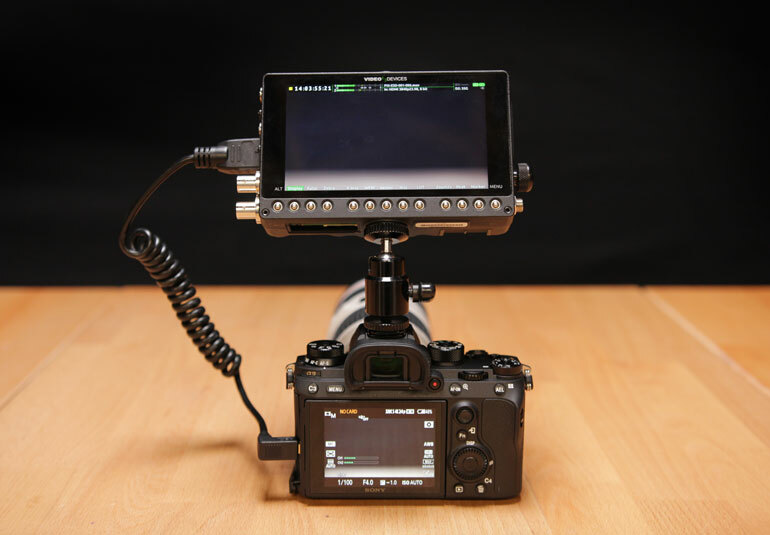 Of course, a bigger screen is always helpful when you're using a small camera with a tiny LCD screen, which is often crowded with on-screen display info. 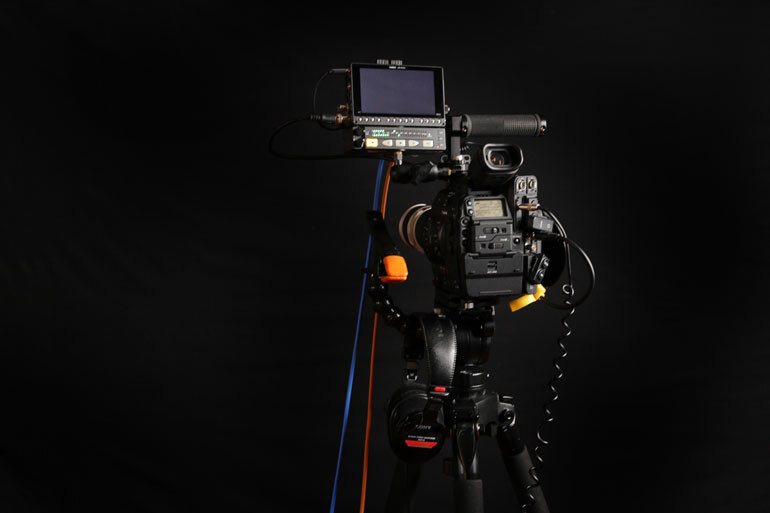 ​But most videographers look to accessorize their small camera with an external monitor because of the higher quality images it can record, usually in a more edit-friendly codec and higher bitrate. 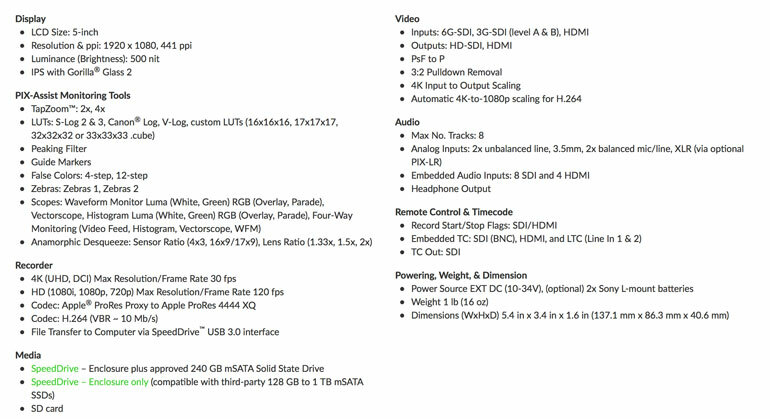 The PIX-E5 can record in several flavors of ProRes, at different resolutions (more specs below). With a GH4 or GH5, you can get a 10-bit 4:2:2 image recorded externally to ProRes, which is pretty neat for such a small camera. Sony A7 cameras, however,​ record 4:2:0 8-bit files internally, and they are limited to 8-bit output through the HDMI port. You do get 4:2:2, giving you twice as much color subsampling, which is a great boost to post-production color adjustments. There are also some who believe that recording an 8-bit signal in a 10-bit wrapper gives the image a little more latitude in post production, for easier editing, but that's a complicated subject. For us, the number one reason to go out and purchase the PIX-E5H for small cameras is actually the PIX-LR audio interface accessory. We'll go into more detail about it later in this article, but essentially, it adds a custom-fitted XLR microphone input/output, utilizing Sound Devices preamps and limiters. And it fits cleanly under the PIX-E without needing additional power. If we shot primarily with a small mirrorless camera, like a Sony A7R III for example, we would keep the PIX-E5H and PIX-LR in our kit for interviews alone. 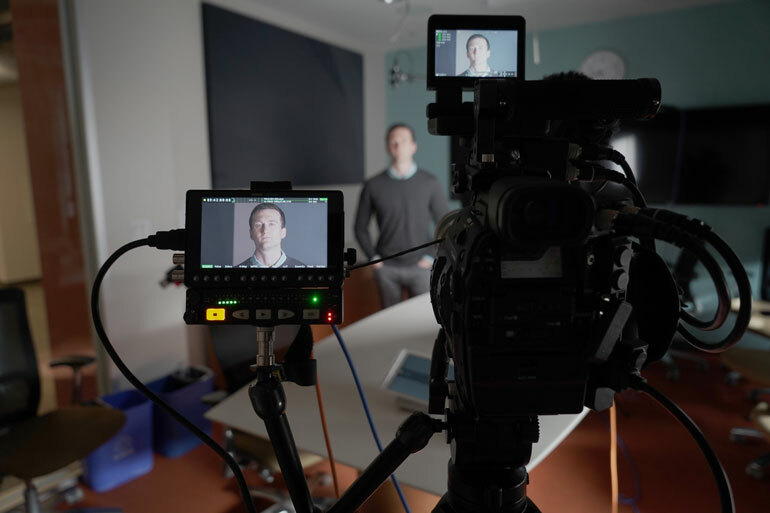 This combo unit would turn the camera into a professional interview camera with both image and audio monitoring, mic inputs, and an external ProRes recording to boot. If you're used to ingesting or transcoding a lot of documentary footage, you know that the bulk of the media is the interviews. And often you can't start editing a project until you have the interview logged, transcribed, or at the very least watched through with some notes. Having the interviews in ProRes immediately available for editing means you can start working on your project sooner. You do need a few accessories right away before you can use the the PIX-E5H and LR with your small cameras. First, you'll need an HDMI cable to whatever HDMI flavor your camera uses, probably a HDMI micro, mini, or strangely in the case of the GH5, a full size HDMI connection. We prefer coiled cables with right-angle connections into the camera. Here's the one we used on the Sony A9 pictured above. You'll also need Sony L batteries of course. You can hot swap batteries on the PIX-E5, so theoretically you could use the smallest size L batteries, but it's safer to use the medium or large versions. And don't forget a solid accessory arm - we have always touted the Cinevate Universal Accessory Mount as the best and most solid and compact mount out there, and it works perfectly on the PIX-E5. Most importantly, however, you'll need to figure out how to adapt the Line 1 and Line 2 XLR outputs from the PIX-E5H into a 3.5mm stereo jack. Something like this. You'll still be able to independently monitor and record both channel 1 and 2 into the PIX-E, but if you want to use your camera's internal recording, you'll most likely end up with a stereo clip that can then be separated into dual mono clips, but that all depends on the specific camera. ​If you're already using a pro camera that has a decent flip-out LCD display with exposure assist, XLR inputs, good codec and bitrates, and dual slot recording for safety, is there a reason to bring along something like the PIX-E5? Back when we were using the Canon C100 as our A-cam, the hot topic was whether an Atomos Ninja 2 or Ninja Blade was an essential accessory that improved the image quality coming out of the 8-bit, 24mbps C100. There were heated debates on both sides of the argument, but the reality is there just wasn't that much improvement in the ProRes recording over the internal AVCHD. At least not enough to justify the added accessory that weighed the camera down. We felt the joy of using a lightweight, bare bones C100 was hindered by adding even the lightweight Ninja Blade. But we did use the Ninja Blade - two of them in fact - for interviews. 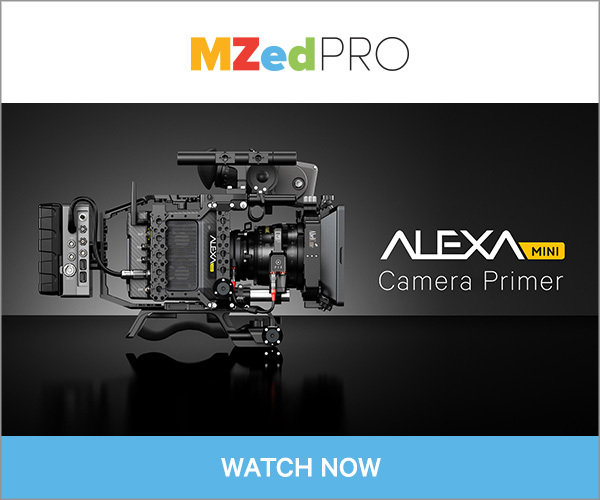 Not only did it help with a better viewing angle, brighter screen, and more accurate colors (a biggie on the C100), but the ProRes recording meant less transcoding time in post production. It was an easy win, and not a big deal to take out during interviews. ​For non-interview shooting, the dual slot record feature made it unnecessary to use an external recorder for safety recordings. In hundreds (or thousands?) 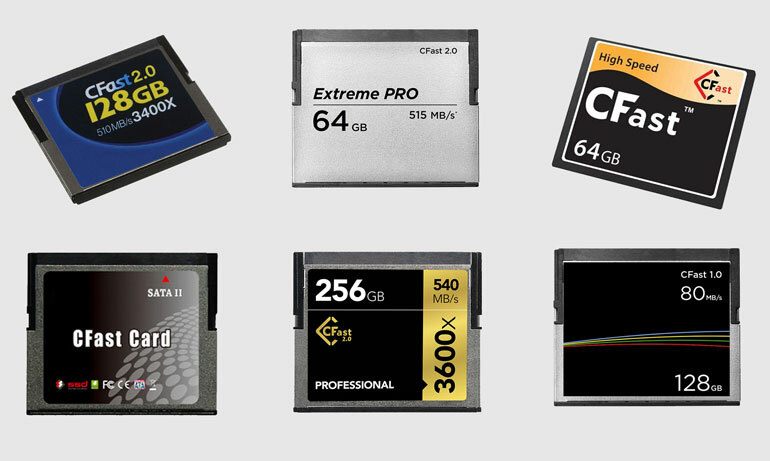 of hours using our three C100s, we have never lost any footage to SD card errors. The fact is, there is no dependable Cfast solution. If there was, every professional who relied on Cfast cards would simply pony up the cost for dependable media. Canon has indeed provided an approved card list for the ﻿C300 mkI﻿I and one for the﻿﻿ C200 - which requires even faster Cfast speeds for Raw Light capture - but there have been camera owner/operators who have experienced complete failure with every manufacturer of Cfast, even the approved cards. SanDisk, Lexar, Atomos, Transcend, Delkin, Angelbird, Wise, Egodisk . . . they all have different speeds and costs, but there’s one thing guaranteed, you’ll experience a failure with any of them at one time or another. In fact, when we searched for Cfast cards at Alibaba, we found one manufacturer that makes Cfast cards for nearly all the major companies. The logos are removed you can see there's Wise, SanDisk, Lexar and Atomos among them. The problem isn’t the manufacturer, or the camera, or even the Cfast media format itself, it’s simply the high stress of 400-1000Mbps recording, at high resolution and framerates, combined with a hodge podge of Cfast readers (each with their own failure reports), and a seemingly fragile TOC Table of Contents system that loses the entire card structure if you happen to pull a card out of a computer before you’ve ejected it. We have indeed lost data with our Cfast cards. Thankfully, the C300 mkII has dual slot recording, as well as Proxy recording on an SD card (which can actually be used for delivery if you lose all your Cfast media), but the 1DX mkII only has one Cfast card slot. 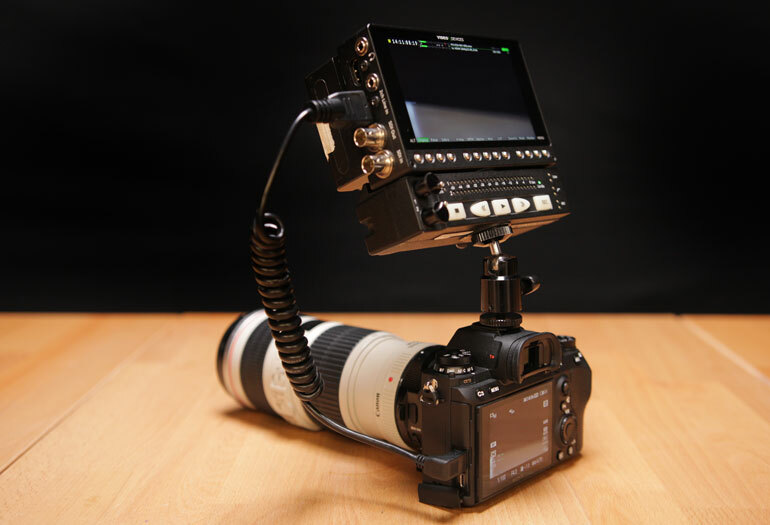 The Cinevate Universal Accessory Mount is our favorite tool to mount a monitor or any accessory. 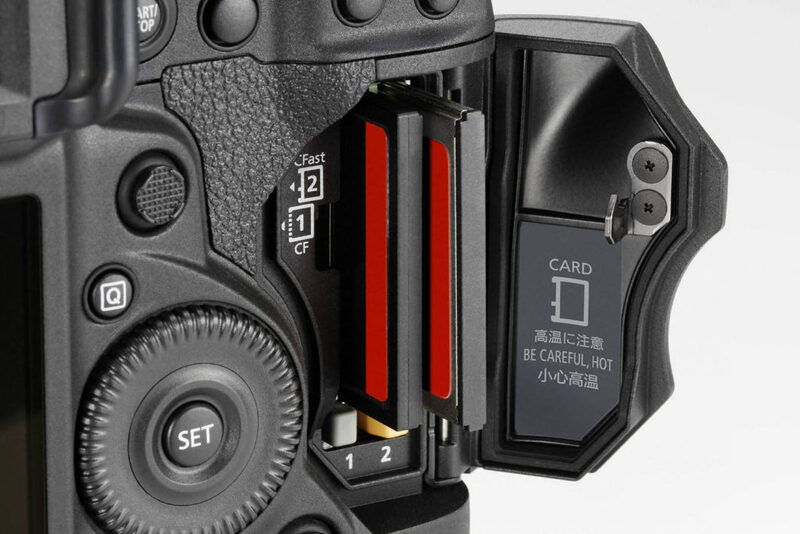 Anyway, the point is, even if you’re using a Sony FS7 II, or a Blackmagic Ursa Mini Pro, or a Panasonic Varicam LT, you can’t depend on internal card recordings when you’re capturing high datarates. Card types and speeds are getting better as always, but they’re also becoming less dependable due to the sheer increase in power and read/write requirements. 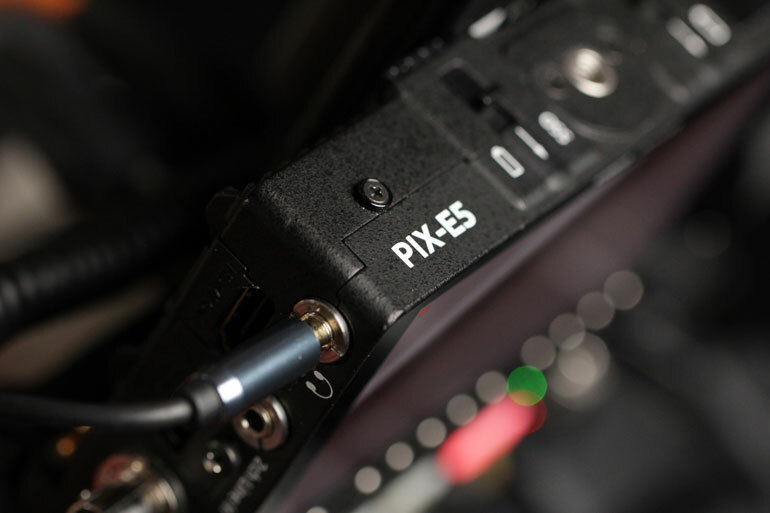 And so, the PIX-E5 with SDI connections has an important place in professional video productions. Not only for the exposure tools, and a better monitoring solution - especially the larger Video Devices PIX-E7 - but because it’s yet another safety recording that you never think you need until you lose precious work to a dumb card error. It’s important to know what your camera can output, and what the PIX-E can input and record. In our case, the C300 mkII doesn’t output 4K baseband video over SDI, only a RAW feed which the PIX-E does not support. If you want to record 4K RAW, only the Odyssey 7Q+ and Atomos Shogun offer that at the moment. 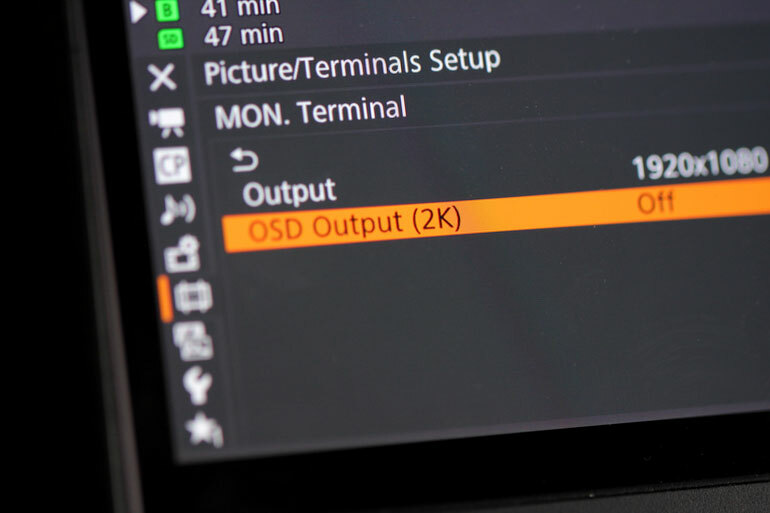 And of course, don't forget to turn off OSD (On Screen Display) when you use an external recorder, or you'll mistakenly record all the meters and info on your camera's display. It's happened to all of us and it will happen to you - so a friendly reminder can't hurt. As a monitor itself, the PIX-E5 is a solid workhorse compared to some of the plasticky monitors out there today. It does weigh a pound, but you know you can trust this thing in any condition, without worrying about babying it. We’ve seen several monitor housings crack and their displays ruined simply by over tightening an accessory arm into the 1/4-20” thread. You shouldn’t have to worry about breaking a monitor while trying to get it attached to your rig in a solid way. 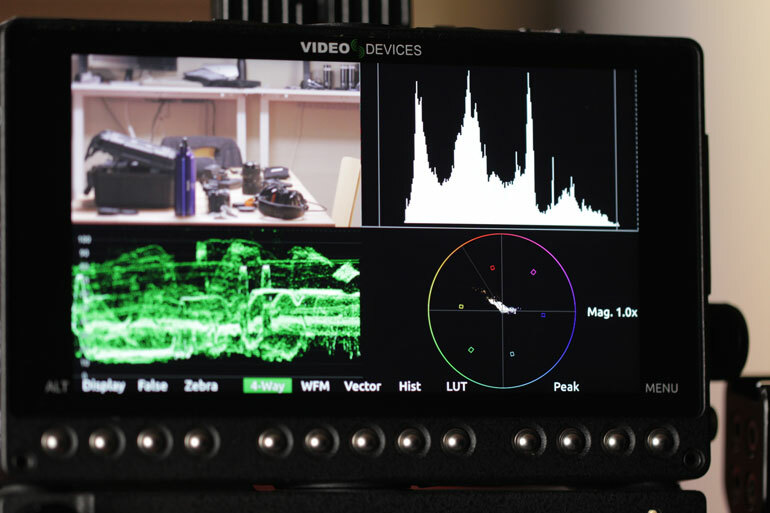 The PIX-E5 has excellent exposure and focus assist tools, including zebras, peaking, false colors, guide markers, and several scopes, including a waveform monitor, RGB parade, vectorscope, and a histogram. You can even see 4 of these scopes at a time. At first we were a little skeptical of all the buttons on the bottom of the monitor, but in use they’re actually a lot faster and easier to access than going into menus, and you avoid smudging the screen. 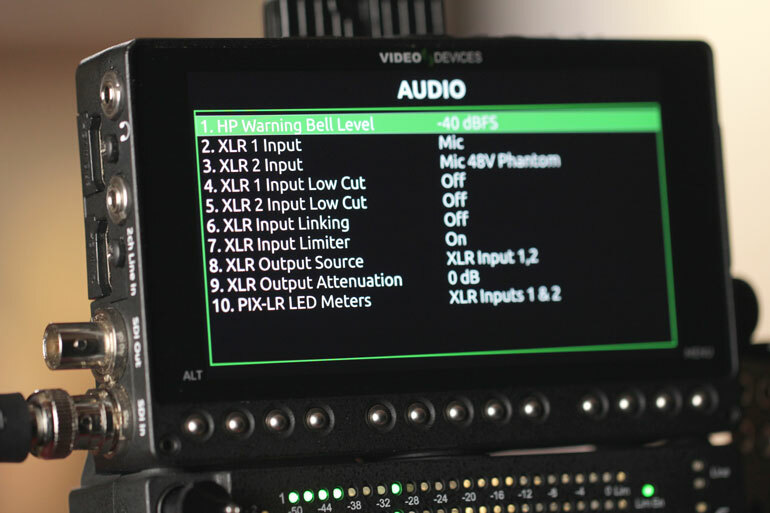 You do have some audio options in the menu even if you're not using the PIX-LR accessory, but if you are, Video Devices ​provides a lot of options for monitoring, recording, and input/output settings. PIX-E supports several LUTs, which are very valuable in helping you judge your image exposure and colors if you're used to only looking at the LOG image. There's support for Canon Clog, Sony S-Log 2 and 3, and Panasonic V-log. And to save you from having to remember to press record on both the camera and the PIX-E5, you can enable the record trigger over either HDMI or SDI. That's one less thing to worry about. ​Video Devices PIX-E5 and PIX-E7 recorders use a proprietary enclosure system called SpeedDrive, which houses widely available mSATA SSD drives inside. You can choose to buy a SpeedDrive that already has a 240gb drive inside, or you can buy a Video Devices enclosure and purchase your own mSATA drive. The good news is, compared to the cost of Cfast 2.0 cards right now, a 256gb mSATA drive is actually pretty affordable. You can place a Samsung 1TB drive inside the SpeedDrive enclosure for less than the cost of one 256gb Cfast card. ​But the real beauty of the SpeedDrive system is that it doesn't need any additional adapters to plug into your computer. It has a USB3 terminal that connects to both the PIX-E and any standard USB port. One more thing: the PIX-E5 has an SD slot as well, so you can record ​HD H.264 clips simultaneously to an SD card. The more backups the merrier. For us, probably the biggest attraction of the Video Devices PIX-E5 and PIX-E5H as a monitor/recorder is that it's a 5-inch display. The PIX-LR audio accessory is an even more convincing reason to choose this recorder over others, but we understand many people are simply looking for a monitor/recorder and already have their own audio workflow down. We're not sure why 7-inch monitors have become the standard for external recorder units, especially when it comes to using them with small form factor DSLR and mirrorless cameras. There are definitely solid reasons to use an external recorder for something like the Panasonic GH5, for example. And if you were at NAB 2017, you would have seen the gigantic billboard ads for the Atomos Inferno paired with the GH5. It's seemingly a match made in heaven, but the size ratio is crazy. That's the GH4 pictured to the right, but the GH5 is not that much different in size. 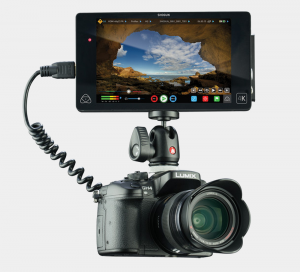 A 7-inch monitor makes perfect sense for interviews, but for standard B-roll and run-and-gun shooting, it would make a lot more sense to pair it with an Atomos Ninja Star that could record 4k. But of course a 4k Ninja Star doesn't exist. . . yet. If it did, it would eat up a lot of external monitor/recorder sales. So the only reason we can think of is that 7-inch monitor/recorders bring up the retail price of the units, without adding that much manufacturing expenses to what a 5-inch version would cost to produce. But in real-world shooting scenarios, a 5-inch display is all you need. It's why the SmallHD 501/502 monitors have been extremely popular. It's why the SmallHD Focus is seen on many DSLRs and mirrorless cameras today. But those monitors don't add record functions. And so, your only options are 7-inch recorders​, or the Video Devices PIX-E5H (the HDMI model, since none of these small prosumer cameras have SDI). And we believe the size difference alone makes the PIX-E5H the better choice. 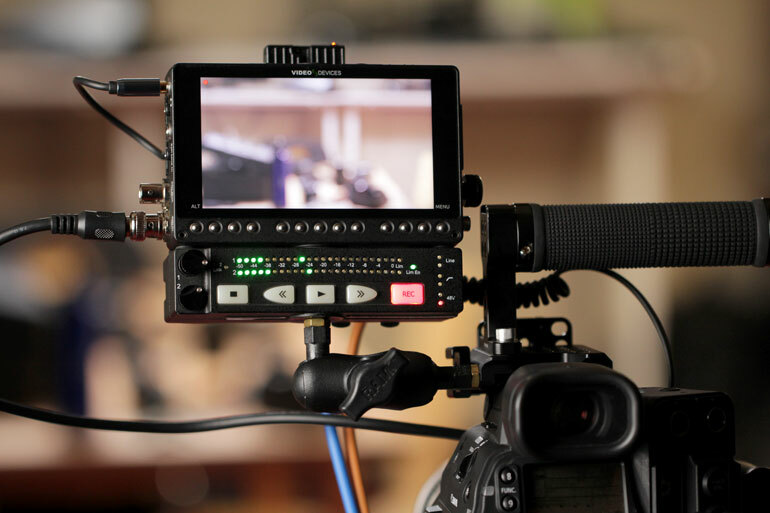 ​There's a lot of good reasons to add a monitor/recorder to your essentials kit for documentary or corporate filmmaking. Whether it's a better view of what you're shooting, or a better record quality than your camera's internal cards, or simply as a backup in case something goes wrong. 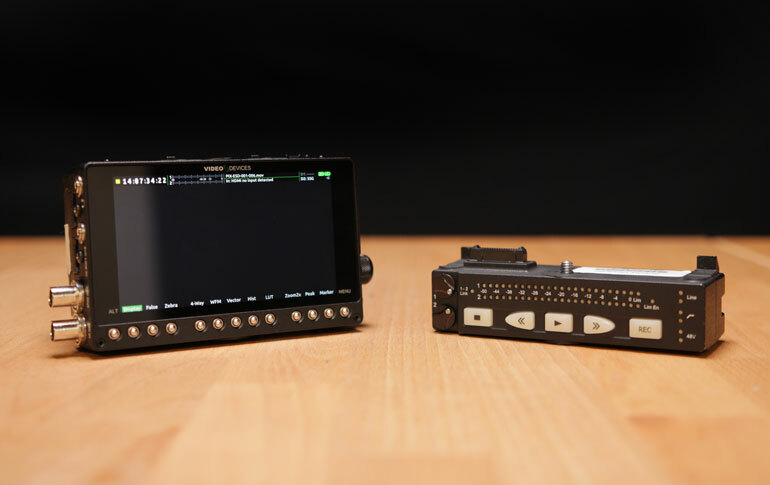 The Video Devices PIX-E5 and PIX-E5H meet the needs of most videographers looking for a monitor/recorder, but with the unique bonus in that it comes in a more compact 5-inch size, compared to the 7-inch monitor/recorders out there. However, there are a few perks to the PIX-E5 that really make it stand out, as mentioned in this article. 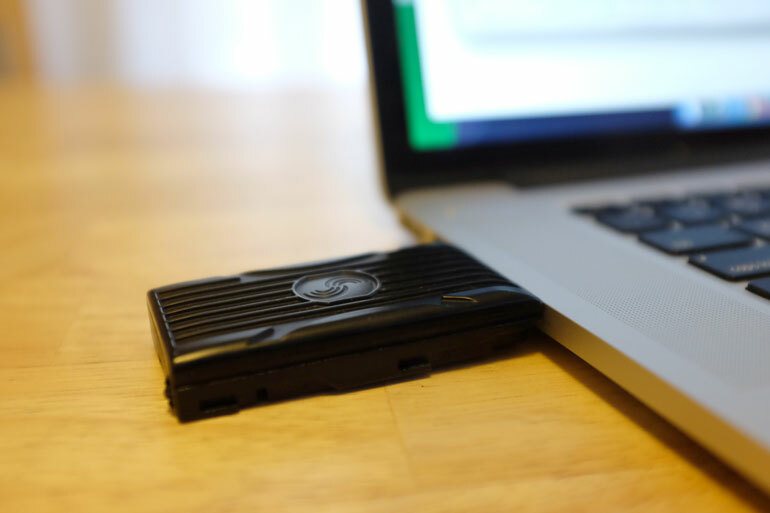 The SpeedDrive media enclosure, the TapZoom, the SD card proxy, and the extremely durable build quality. But the one thing that makes the PIX-E5 shine is the optional PIX-LR audio interface. Together, this kit could become an essential piece to any interview shoot, on any camera out there. We still love our MixPre-3 and use it on every interview these days, but if we were to bring the PIX-E5 along, we'd route all of our audio through the PIX-LR. In fact, we loved using the PIX-E5 / PIX-LR combo on our recent multi city production tour. 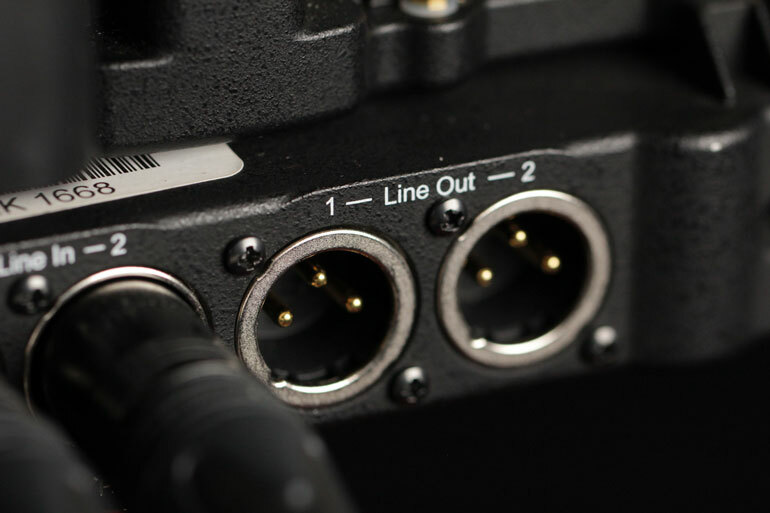 Even with our C300 mkII, which already has the proper audio inputs. It just made life a little easier, and we worried less about corrupt Cfast cards, or messing up interview audio.